Many families are still celebrating Hanukkah. 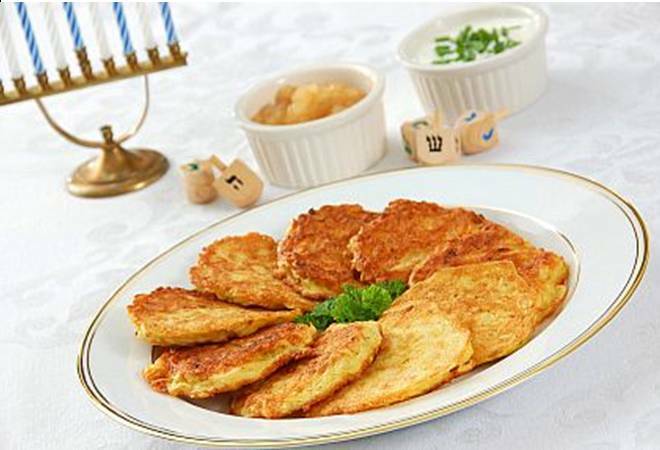 Latkes, or potato pancakes, are the traditional Hanukkah dish for Eastern European Jews. But, all children like latkes so all nannies and au pairs should consider making the children latkes during Hanukkah, even if the kids in their care don’t celebrate Hanukkah. The reason that latkes are a traditional Hanukkah dish is because of the oil the latkes are fried in. When the Jerusalem Temple was recaptured and reconsecrated by the Maccabbees, only one night’s worth of oil remained to light the temple. Miraculously, though, the oil lasted eight nights, or enough time to make more oil. That’s the miracle of Hanukkah. This recipe makes about two dozen small latkes. 1. Grate the potatoes and the onion. The easiest way to do this is using a food processor. 2 . Mix the grated potatoes and onion, beaten egg, salt and pepper, and matzoh meal or flour in a bowl. 3. Heat a skillet over a medium flame. 4. Add 1 to 2 T. oil. 5. Form the potato mixture into small cakes of about two or three T. per cake. Don’t make the cakes too big since they’re easier to turn when small. 6. Flatten the cakes slightly with a spatula. 7. Cook until the cakes are nice and brown on the bottom, then turn and cook the other side. Repeat with the remaining potato mixture. 8. Drain on paper towel and serve warm. 9. Applesauce and sour cream are traditional accompaniments for latkes. To make latkes that are kosher for Passover, don’t use flour, only matzoh meal.